Catherine was the daughter of Charles Schiff, the eldest of Leopold Schiff’s sons. Edith and Rose were the children of their uncle Alfred, younger sisters to Sydney Schiff. 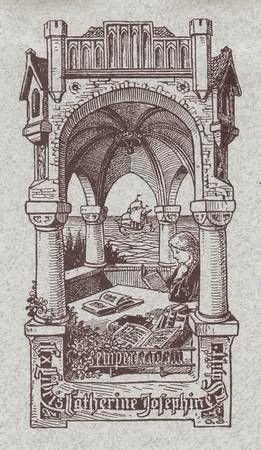 The book has her bookplate, giving her full name as Catherine Josephine Schiff, and shows her reading, with a ship in the background, a punning reference to her surname. 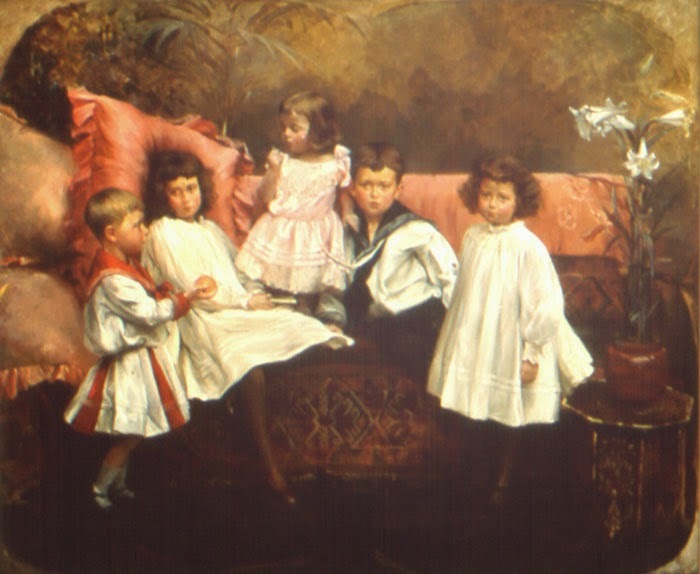 Here she is in a portrait of the Schiff children. She was the eldest child, so it must be her second from the left, next to her younger brother Martin, then her younger sister Lucile, her younger brother Charles, and her other sister Mary. She was born in the summer of 1884 in London. Catherine married on 28th November, 1912 at St George’s, Hanover Square, in London. Her husband was Francis Storrs, younger son of the Dean of Rochester. According to Wikipedia his older brother was Sir Ronald Storrs, a famous Arabist and Imperial administrator: he was Governor of Jerusalem, Cyprus and Northern Rhodesia. Francis is described on Wikipedia as an academic and intelligence agent. Just over three years after their marriage, in the Spring of 1917, Catherine gave birth to their first son, Peter John Francis Storrs. Just over a year later on 26th May, 1917, she gave birth to their second son, Martin Basil (he appears to have been known always by the second name). He was, of course, named after Catherine’s brother Martin Schiff, who was killed in action on 16th June, 1916. At this time Catherine’s husband was away, engaged in his military duties from 1916 in Greece. he returned to his wife and two young sons in the Autumn of 1917, but he fell a victim of the Spanish Flu, dying in the night before the Armistice, a death that coincided with that of Catherine’s uncle, Sir Ernest Schiff. As war ended Catherine was left a widow with two very young sons. Basil lived till the Summer of 1976, living at 33, Buckingham Palace Road. He appears never to have married, and his mother lived with him until her death in the Autumn of1956 after which he lived alone. Basil appears to have been an early aviator, and there is a record of him, living at 65, Chester Square, London, and receiving a flying certificate on 18th September, 1937, from the Cinque Ports Flying Club. There are some other clues: in 1931 aged 14 he sailed from Quebec to Liverpool with his mother and older brother, and in 1936 aged 19 he sailed with his mother from Southampton to Quebec. His father's father had left England and emigrated to Nova Scotia, which may explain these journeys. There is also a mention of a Basil Storrs in 1946 apparently in the diplomatic service as a third secretary in post-war Poland. Peter like his younger brother Basil followed the family tradition of a career in the diplomatic service. there is an excellent obituary of him in the Radleian, his old school magazine. It appears then that neither son married or had children, though Peter Storrs' name lives on in the form of a charitable trust. Catherine Schiff contributed a chapter to this book as well as being an editor.